A non-greasy, tinted formulation that blends easily with the skin tone. It protects the skin against premature ageing & tanning with a broad spectrum protection against sun's harmful UVA & UVB rays. Enriched with Ceramide III, Saxifraga & Carrot Extracts, it works to reduce skin pigmentation and tanning leaving skin looking fresh and even toned. Explore the entire range of Face Sunscreen available on Nykaa. 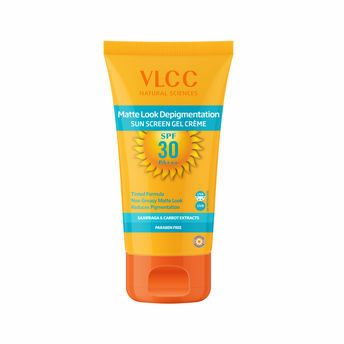 Shop more VLCC products here.You can browse through the complete world of VLCC Face Sunscreen .Alternatively, you can also find many more products from the VLCC Matte Look SPF 30 Sun Screen Gel Crème range.